10 more essential browser add-ons. There are so many plugins, add-ons, extensions and toolbars available for the major browsers that it can be tempting to simply ignore them all in favour of a easy, uncluttered life. Yet many of these add-ons can be incredibly useful, providing better integration with your favourite web services and plugging gaps in your browser's functionality. To save you the chore of wading through the Google Chrome, Firefox and Internet Explorer extension galleries, we've picked out 20 of the very best utilities you can get your hands on, and they're all free to use. If you have any plugins of your own to recommend, do let us know in the comments. Buffer's primary purpose is to pad out your social media sharing across the day, letting you queue up tweets and Facebook posts. It also makes sharing across multiple networks easy and includes built-in analytics too. With browsers now remembering your passwords automatically, you don't need a separate extension... or do you? LastPass offers a huge number of features, including cross-platform compatibility and enhanced security. On today's modern web, spelling checks and word definitions are never far away, but the Google Dictionary extension for Chrome makes life as easy as possible. Simply double-click on a word to see a definition window pop up. This extension adds another option to your list of search providers in Internet Explorer. Wikipedia Visual Search lets you see at a glance the encyclopaedia entries that match your search terms, including a thumbnail picture for easy reference. 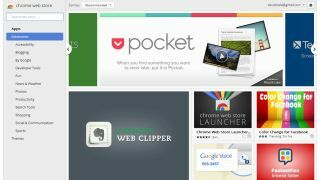 Pocket is a place to save everything you want to look, but don't have time for right now. Using the browser extensions for Chrome and Firefox, and the bookmarklet for IE, you can save articles, images, videos and more. If Pocket is a little too loud and flashy for your tastes, try Instapaper. Instapaper converts any online article into a cleanly rendered, minimal page. There's an extension for Chrome, and a bookmarklet for other browsers. Give your Gmail contacts a social media boost with Rapportive, which pulls in details from Facebook, LinkedIn, Skype, Twitter and more to add extra information to the right-hand pane. Firefox and Chrome compatible. Google Reader may be gone, but the company's RSS Subscription Extension lives on. Install this utility in Chrome to instantly access all of the available feeds on a page, without having to hunt around to find the relevant links. Found something you just can't wait to tell friends and family about on Facebook? Share on Facebook is an Internet Explorer Accelerator (a fancy name for an extension), which allows you to share a link or picture from the browser's right-click menu. Next Page 10 more essential browser add-ons.